Also in Russian: эта статья доступна и на русском языке. As shown in the graph, over a 2-day period, the Zabbix server handles around 9.26k NVPS on average. I’ve actually had short lived spikes all the way up to around 15k and the server handled them just fine as well. In short – awesome! One of the first questions to consider is the type of architecture to use. Should the Zabbix server be highly available? Does an hour or two of downtime matter? What are the consequences if the Zabbix database goes down? What type of disks will the Zabbix database require and what RAID level? What kind of network is there between the Zabbix server and the proxies? Is there a large amount of latency? How will data get into Zabbix – will data be pulled (passive monitoring) or pushed (active monitoring)? Identifying the proper hardware to use can be difficult. You’ll find a list of what I am using at the bottom of this section. I opted for high performance SAN space for my database servers because the Zabbix database requires a lot of I/O. In theory, the faster the database disks, the more data Zabbix will be able to handle. Also, CPU and memory are important to a MySQL database. Lots of memory allows Zabbix to hold frequently accessed data in memory which in turn increases performance. 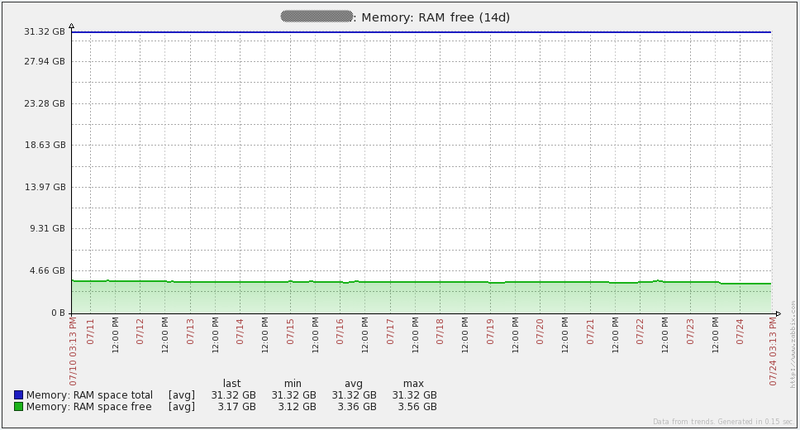 Originally I wanted to get 64GB of RAM for the database server, but 32GB seems to work just fine so far. My idea behind the fairly powerful Zabbix server was that it will be responsible for evaluating hundreds of thousands of triggers. That will take some CPU power, so it can’t hurt to have plenty available. Memory wise, I probably could have scaled down to 12GB since I do not have many processes running on the Zabbix server (it does very little monitoring itself). My Zabbix proxies don’t require significant amounts of hardware, which is why I opted to use VMs. I mainly use active items, so the proxies are mostly serving as collection points and are not doing large quantities of data collection themselves. This points to a directory that holds crons that should only be run on the active server. The crontab on each server should access all crons through this symlink. An example configuration file and an LSB compatible Zabbix server init script to accomplish all of this is available for download here. A few parameters will need to be modified in the example pacemaker configuration file (enclosed within “<>” tags). Also, the init script is written with the idea that all Zabbix files are under a common location (for me, all files are under “/usr/local/zabbix”). You will need to modify the init script if that is not the case. A highly available Zabbix server process is not much use if the database can easily go down. There are many approaches to highly available MySQL – I will only cover the approach I took. This IP is meant to be used when read-only access is wanted to the Zabbix DB. This way, ad-hoc type things can hit the slave (if it’s up), instead of the master. In a failover event, the MySQL instance on the newly active server will become a MySQL master. Once the newly passive server is available, it will become a slave of the new master. An example configuration file is available for download here. A few parameters will need to be modified in the example pacemaker configuration file (enclosed within “<>” tags). Also, for this to work properly, you may need to download a different MySQL resource agent for use with pacemaker. A link to that is found in some awesome documentation on setting up a MySQL master/slave cluster with pacemaker in the Percona github repository. In the event that the link to the documentation dies for some reason, there is a copy available here. They can handle an incredible amount of incoming data when set up correctly. During testing, I had a single proxy (“Proxy A”) taking in around 1500-1750 NVPS without any problems at all. And that was on a 2 vCPU and 4GB RAM virtual machine with a SQLite3 database! “Proxy A” was in the same datacenter as our Zabbix server, so the network latency was virtually non-existent. “Proxy A” was really busy pulling in all those metrics, but proxies with small amounts of network latency between them and the Zabbix server can handle large amounts of data. Note that “Proxy A” was an active proxy and most of the items it was monitoring were from active Zabbix agent items. The proxy initiates a connection to the server. The proxy sends a maximum of 1000 values. The proxy closes the connection. The initial connection is slow. In my case, to set up the initial connection takes at least 0.25 seconds. Ouch! Since the connection is closed after sending 1000 values, the TCP connection never exists long enough to speed up to the bandwidth available on the link. To give you an idea of just how slow this is, “Proxy A” had the same virtual hardware and was able to send 40,000 values within 2-3 seconds. Much better! When I first started exploring the use of Zabbix in our large environment, I was running MySQL 5.5.18. The database ran just fine for a while, but once I hit around 700-750 NVPS, the MySQL process on my server would start using 100% CPU and the database performance ground to a halt. I tried playing around with configuration settings in MySQL, enabling large pages, partitioning tables, and tweaking various Zabbix settings, but none of that seemed to work at all. My much-smarter-than-I wife suggested upgrading MySQL to 5.6 to see what happened. Amazingly, the database performance was perfect after the upgrade. I never was able to get 5.5.18 to work, but 5.6.12 works great in my current environment. For reference, here’s a copy of my my.cnf file. Notice that “Com_update” has the highest number of queries per second. The reason for this is that every value retrieved by Zabbix results in an update to the “items” table in the database. The other thing to point out with this is that the database is write-heavy. This means that the MySQL Query Cache will not help performance. In fact, it could cause a performance decrease due to the constant need to mark stored queries as invalid as data is modified. All history data in a table for a particular day/week/month/whatever can be self-contained in its own partition. This allows easy deletion of old data later on with almost no impact on the database server and it makes it easy to see just how much data is pulled into the environment for whatever timeframe your partitions are set. With MySQL InnoDB tables, deleting data does not release disk space. It simply creates areas in the InnoDB namespace that can later hold new data. It is impossible to shrink an InnoDB namespace, however, partitions can be deleted at will. Deleting partitions will cause disk space to be freed. Learning how to partition things can be annoying at best, but there is an excellent article on zabbixzone.com about partitioning tables in Zabbix 1.8. The instructions can be modified to apply to 2.0.x with the history and trend tables. Many of the comments on the article from other users are useful and have modified versions of the original procedures that appear on the post. A copy of the stored procedures that I use to add/drop partitions are available here. These procedures create daily trend/history partitions and are modified versions of the procedures found on the zabbixzone.com article. Please note that you must first create partitions on your history tables before you can use the stored procedures. Also, my version of the procedures does NOT delete “trend” or “trend_uint” partitions. My trending data will theoretically be around forever. Zabbix provides two different methods for retrieving data: active or passive. If you’re not clear on what the difference is, think of it like this – the Zabbix server/proxies pull data from agents for passive items and Zabbix agents push data to the Zabbix server/proxies for active items. By definition, Zabbix trapper items are active because they require data to be sent to the Zabbix server/proxy (using “zabbix_sender” or some other method). The reason I bring this all up is because the type of monitoring used can have a drastic effect on how much data Zabbix will successfully be able to ingest. 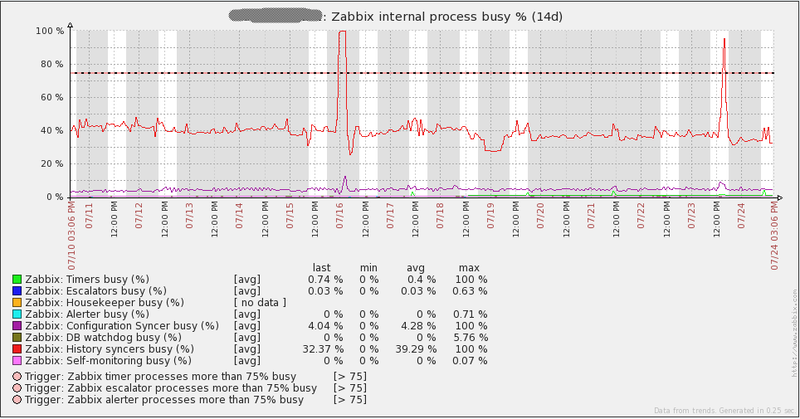 Passive monitoring requires polling processes on a Zabbix server/proxy to make a request to an agent and then wait for a response. Depending on your network and the performance of the server being monitoring, the poller may have to wait for a few seconds to get a response. Multiply that across even just a thousand servers, and polling can turn into a very slow process. Now let’s talk about active monitoring. 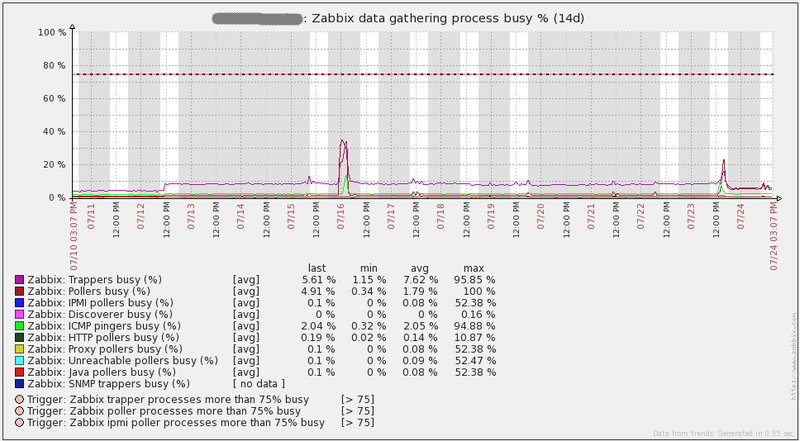 With active monitoring, the Zabbix server/proxies simply wait for a connection from an agent to be made. Each individual agent will periodically connect to the Zabbix server/proxy to get a list of items that it should be monitoring. The agent will then monitor each item according to its interval and then send the results as needed. A connection will only be made to a server/proxy once an agent actually has data to send. This method of monitoring prevents the Zabbix server/proxies from needing to wait for a check to complete before getting the data. This increases the speed at which data is retrieved. In my environment, this is the method that is used. I’ll just say this straight out – if you think that you will be able to make a decent installation of Zabbix without monitoring the internal server processes – you’re full of it. You must monitor these processes to get an idea of where any bottlenecks are or even to identify processes that you can scale back to save resources. The documentation on these items can be found here. A good blogpost on these items is on the Zabbix blog as well. The default Zabbix server template that comes with Zabbix 2.0.x has these items already configured. Make sure you add these items to your Zabbix server! One of the statistics that can indicate database problems is the free space in History Write Cache (the “HistoryCacheSize” variable in the server config file). The value from this item should always be close to 100%. If this cache continually becomes full, it can mean that Zabbix cannot write incoming data to the database quickly enough. Here are some performance graphs for my server. You’ll notice some spikes/dips on July 16th. I’m not sure what happened in that event. I had to re-initialize the database on all my proxies to resolve the issue (I was using SQLite3 at the time). I have since migrated to using MySQL databases on my proxies and I have not seen the issue again. Other spikes in the graphs are from load testing. From looking at these graphs, it is easy to see that the hardware I’m using could be overkill for some time to come. 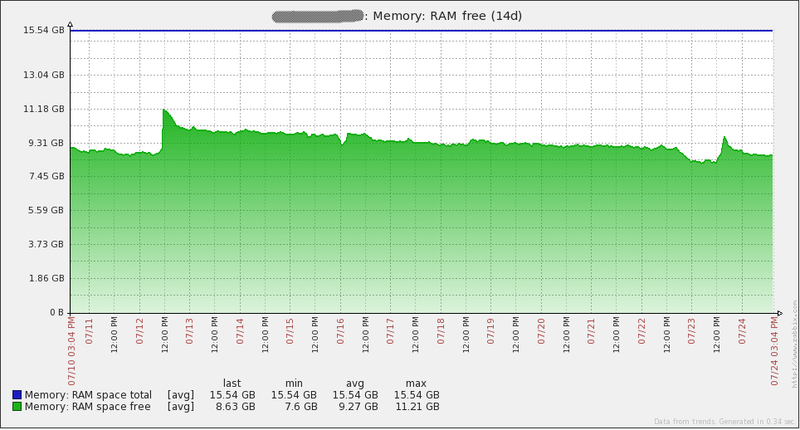 Here are some performance graphs for my database server. You’ll notice some large increases in network traffic every day or two. Those are when my database backups run (mysqldump). You’ll also see a large dip in the queries per second graph on the 16th due to the issue I mentioned above. In total, my current environment has 2 Zabbix servers, 2 MySQL servers, 16 Zabbix proxies, and thousands of Zabbix agents. With that many servers to manage, manually making changes to configuration files is not really an option. My company currently uses Puppet to deploy applications, but it is not currently set up for configuration management. As a result of this, I had to come up with my own way to manage configuration files across development, staging, and production environments. Thankfully, I have access to a Git repository where I can store all my configuration files. All of my servers have access to that repository, so I took advantage of it to store any scripts, configuration files, or anything else that I want to synchronize across all servers. I wrote a script that can be called through a custom User Parameter available on all of the agents. When I call the custom script, it automatically goes out to the Git repository, pulls down all the latest files, and then restarts the agent/proxy/server if the configuration files had changes. In this way, rolling out changes to my entire environment is as easy as using the “zabbix_get” command. Along with managing configuration files, creating thousands of hosts manually in Zabbix is not viable. My company has a CMDB where information about all our servers and the services that run on them is stored. Every hour I have another script that pulls information from the CMDB and then compares it to whatever is in Zabbix. It will then Add/Delete/Enable/Disable hosts as needed, create hostgroups, move hosts into hostgroups, and assign hosts to templates. In this manner, the only part of adding a host that I need to be involved in is if a new item/trigger needs to be implemented. Unfortunately, due to them being so tightly integrated with our systems, I cannot post the scripts here. Even with all the work I’ve put into this there is still one major issue to resolve. Look into Percona XtraDB cluster. A 5.6 version hasn’t been released yet, so I’d have to wait to try out this option (since I had performance problems with MySQL 5.5). Here’s the list of downloads/URLs I reference all over in this post. I actually don’t have any files in “/usr/local/zabbix/etc/proxy.conf.d/” and the only files in “/usr/local/zabbix/etc/agent.conf.d/” are custom userparameters, so nothing special. As for the auto-update script, I can’t post it here. It is tightly integrated with my company’s systems and would require significant work to make it available to the public. My script is quite different from the one on zabbixzone.com. I don’t use the system.run key at all. To do the restart after the update in my script, I use “screen” to run the command “/etc/init.d/zabbix-agentd restart”. Unfortunately, that wouldn’t work on windows servers. I don’t have any windows servers, so I haven’t had to do any work on those. Thanks for the article ! Very useful !!! Any reason that you don’t using Zabbix discovery and action to add new host and assign it to relevant template ? How do you verify that all monitors are running (you have 53 items not supported) ? How many active alerts do you have ? Which dashboard/console are you/NOC using to see the alerts ? Did you create IT Services ? if yes, how you modify it once you add new servers ? I don’t use discovery because my hosts are scattered across dozens of subnets. Discovery would be very difficult to manage in my network (especially since I currently only monitor a very small portion of our devices). Our security team also wouldn’t particularly enjoy having Zabbix do port scans across huge swaths of the network :). Also, not using Discovery makes it easier for me to control exactly which devices on our network get added to Zabbix. The only decent way to know when items are “Not Supported” in Zabbix 2.0.x is to have triggers using the nodata() function. That’s how I check items I expect could go to an unsupported state. Our impletmentation of Zabbix is still ongoing, so there aren’t many active alerts. Our NOC uses a custom internal dashboard (not Zabbix) to view active alerts. Zabbix will have a script that submits triggers to that custom system via an API. No, I have not created IT services. Nice article and great solution for big networks. Can you give me more information about your CMDB (which software do you use) and how to make import hosts from this system into zabbix. The CMDB that I use was developed internally by my company. Due to that I can’t really give details on how it works other than say that it stores information about all of our servers including the services that run on them, IP/DNS addresses, and their status (online, production, etc.). The scripts I use to automate adding hosts are closely tied to the CMDB, so it isn’t possible for me to make the scripts available either. Could you possibly revisit this? I’m running Percona XtraDB Cluster 5.6, but I can hardly pass 300nvps let alone 9000. As a side note though, I do SNMP polling and both Zabbix and Percona are on the same server. There doesn’t seem to be any hardware limitations though, it seems to be a database connections issue. yuusou, there are many different things that can cause the issue you’re experiencing. I highly suggest getting on #zabbix on freenode to work through your issue. I’m “heaje” on there. My name is Sheun and am so glad you publish this article. It is indeed helpful, I will need to deploy such an Architecture for my office. We currently deploy Zabbix on a default basis and our NVPS is about 102 and now giving fault (Zabbix Server Down). It will only come up after taking out some monitored device which in turn reduces the NVPS. I will like to have you support has I deploy and I can be reach on [email protected] for further discussion. seunds1 – I’d suggest reading over https://www.zabbix.org/wiki/Getting_help and using one of the available options there. Specifically, the IRC channel on freenode is an excellent place to get support. I have a single server install that performs great. I second the use of proxies if you are looking for performance. I have 5 proxies in total 4 pretty evenly distributed and 1 with only a handful (location based). The other real difference maker is dedicated disks. 4 disks setup in RAID 10 separated from the OS (2 disk Raid 1). Currently getting 15k+ NVPS (And I have trapper items outside of this also). I also have another 4 disks in RAID10. I had the items table and DB Log on here while the history and trends on the other 4. Works amazingly performance wise, but getting MySql to work with the links if I had to do any DB maintenance was more pain than I bargained for, so they currently are unused. Another thing I do not have a lot of users accessing my GUI. I generate alerts into another system which keeps my DB writing like mad, without a lot of user driven reads. Any chance you could share the item keys for proxy NVPS and values to sync? Derp, nevermind, I just found it in the article. Can I ask how long did it take you to setup all the items, triggers, actions for your environment? Did you use scripts to automate the trigger creations? Our biggest concern using Zabbix is the amount of work that is involved in maintaining all the items and triggers for such a large number of devices. Little bit of a necro reply but this is the first result on google when you start digging into Zabbix performance ;). I roll Zabbix at my company and I can say trigger maintenance is a breeze. We have a smaller set up than this but with a much much higher item/trigger density per host than what’s shown in this article. Zabbix’s templates have an inheritance concept for tuning triggers. Even after applying a template, you only have to change it in one spot. the same is true for discovered triggers/items. We have Zabbix to the point with puppet that we don’t even add or configure a host when we spin one up in AWS or on-prem. we used to use discovery rules (which worked great but there are some edge cases) but later opted to write our own API based discovery script. It configures the host info, what templates to use, and host groups. Most of our time isn’t spent tuning or maintaining triggers. There’s always going to be some trigger tuning as you add new templates but that’s true of all monitoring platforms. We spend most of our time creating new items for developers so they can better understand their application. How you got the real NVPS metric?